Outre sa splendide vue mer et la qualité de sa rénovation, l'une des grandes qualités de cet appartement c'est que l'on peut se passer de voiture puisque tout est à proximité. Il n'y a qu'à traverser la rue pour se rendre à la plage ou marcher 5 à 10 minutes pour se rendre soit à la plage de Beaulieu-sur-mer ou celle de Villefranche-sur-mer et ses sympathiques restaurants sur le port. La gare de Beaulieu est à 15 minutes à pied et il y a un arrêt de bus tout près de l'immeuble. Si vous avez une voiture, vous pouvez la garer derrière l'immeuble à l'une des 7 places réservées aux propriétaires. Ces places ne sont pas attribuées à un appartement en particulier. La terrasse est assez vaste pour y manger à au moins 4 personnes autour d'une jolie table ronde en granit. L'appartement est équippé d'un home cinéma, d'un lecteur de dvd blue ray et d'une machine à café Nespresso. La salle de bain est aménagée avec une grande douche à l'italienne. The appartement was very nice; clean, well equipped and high standard overall. Great sea view, even better than it appears on the pictueres. We had very good communication With the host, everything went smooth. We had the best week there, really hope to be back some time, thanks Norman ! Ein wunderbarer Urlaub. Das Apartment liegt ruhig an einer kleinen Straße mit traumhaftem Blick auf eine kleine Bucht in der sich die Schiffe und Yachten tagsüber nur so tummeln und man eigentlich das Apartment gar nicht mehr verlassen möchte. Dank Norman's detaillierter Beschreibung haben wir uns sofort sehr gut zurecht gefunden. Das Apartment ist sehr gut ausgestattet und liebevoll eingerichtet. Alle Küchenuntensilien sind üppig vorhanden. Das Bad wurde kürzlich renoviert. Wir konnten sehr viel zu Fuß oder mit dem Bus unternehmen. Es blieben keine Wünsche offen. We enjoyed our stay at this apartment a lot. It's perfectly located, quiet and with a stunning view from the terrace and very close to some small beaches or to bus stops to Monaco or Nice. We stayed there for one week and wished to have some more time: just sitting there and watching the ships and yachts. The kitchen is very well equipped. Bathroom is very modern. Everything is very well decorated. Thank you, Norman, for the great tips to get around. There was no need to use the car. Vielen dank. Should you come back another time, I will have more interesting ideas to share. Interesting enough, this is why I bought the property to be able to go around without a car. This is our second stay in this lovely apartment and hopefully we will get to enjoy it again next year. Normand is so helpful and our booking is always handled efficiently. What can I say - the view from the apartment must be one of the best in the French Riveria. Each day there are new boats and ships to see and the little bay is perfect for swimming, stand up boarding (which we loved) and snorkeling. The apartment block is in a very quiet cul-de-sac and is tidy , secure and well run. It is perfectly situated to catch the bus either in the direction of Nice or Monaco and supermarkets are about a 15min walk. It is also close to the lovely bay of Villefranche if you don't feel up to cooking - lots of restaurants on the waterside to enjoy. I do recommend a gorgeous restaurant there called Les Garcons - very romantic to sit under the stars and enjoy seafood or amazing lamb shank which they are famous for. We also enjoyed Paloma Beach which is a quick bus ride away from the apartment and truly beautiful. I would recommend this to both families and couples and am hoping to take our family there again soon. You won't be sorry its the best place to explore this beautiful part of the world from. Dear Daniel, thanks for your kind words. It is such a pleasure to share the same passion about this beautiful part of the French Riviera. I am very glad to have the opportunity to welcome you again next july. 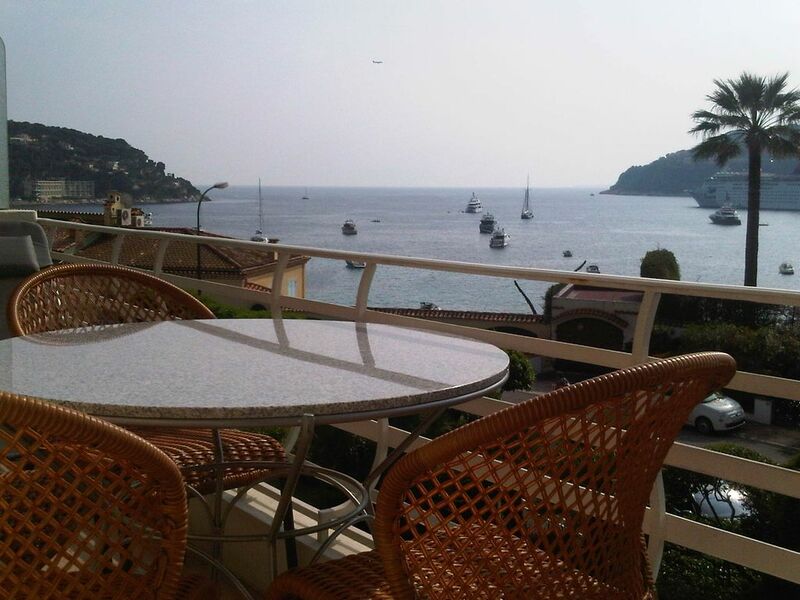 Cute little appartment close to 3 beaches, and close to the 3 villages of Villefranche, Beaulieu and Saint Jean Cap Ferrat. Balcony with nice view of the bay and sunset. Many thanks Norman! Thank you Alexandra for your kind comments especialy from someone who knows Cap Ferrat so welI. I was very pleased to meet you and sincerely hope you will have the opportunity to come again.